Ah, yes, I already have some "Bloody Mess" markers from my Fallout miniatures collection to represent critical hits. And that comment may have been influenced a bit by the front page of Reddit yesterday being on the Tiananmen Square Massacre of 1989. Hmn, but that's perhaps too heavy a topic for this silly thread. Currently I have that set of German Zombies from Studio Miniatures, another twenty Soviet Zombies from West Wind, and then if I'm desperate for more, a load of Warlord Games plastics done up as zombies (West Wind heads). Though I'm thinking of chucking the Warlord plastics and sourcing some Konflikt 47 German zombies on the cheap (they have better proportions). Only ten of the Studio Miniatures set are painted so far, but I have a few weeks to finish the rest. I'm trying to nail the right skin tone at the moment, and will probably go for something more pallid than what I've tried so far. Ah, more pictures forthcoming as I actually finish them. The Panther 2 and the T 44 both looks superb! Took your advice and ordered some goodies from Heer 46. Nice to see the stuff in scale though! And looking forward to the zombies, if you end up posting pictures despite them being very 'ridiculous' alternate history. I'm trying to nail the right skin tone at the moment, and will probably go for something more pallid than what I've tried so far. Ah, more pictures forthcoming as I actually finish them. I did mine using Humbrol 90 as a replacement for rotting flesh (I sprayed the lot with PSC Field Grey first, flesh in Humbrol 90 then Citadel Drakenhof Nightshade. I tried his method on a freebie from Salute and then redid my Prelude to Woodbury walkers. An alternative is to use Citadel Rakarth Flesh, lighten with Citadel Wycth pallid flesh and shade with Citadel Carronburg Crimson (that might also be the recipe for Cave Goblins(tm)). I hope this might be of use. The things that you come across on the internet. A Bulgarian pillbox made out of a T-34 with a T-62 turret. Enough foresight went into this for them to increase the size of the turret ring. Though as its a pillbox they removed the engine as well (which would get in the way of the turret. ...Not that I already tried fitting a T-54 turret to a T-34 and came across this issue). Oddly enough Blizkrieg's T-54 turret fits Warlord's IS-2 turret ring perfectly too. Hmn, so there's an idea. A prototype modification to bring the T-54 turret to the T-34 as some ill advised modernisation project. Obviously doing something about the turret ring and engine so it can actually support the thing. Probably not any extra armour though, as I suspect the new turret would already be messing with the weight distribution. ...Or is this idea just too silly? Your first image does display as a complaint from Track-Link. More interesting denizens of the 'net. Okay, what is the source of the tank/lorry hybrid? You do not see enough Panzer IVs in post war service. The first image is just another angle on that T-34. 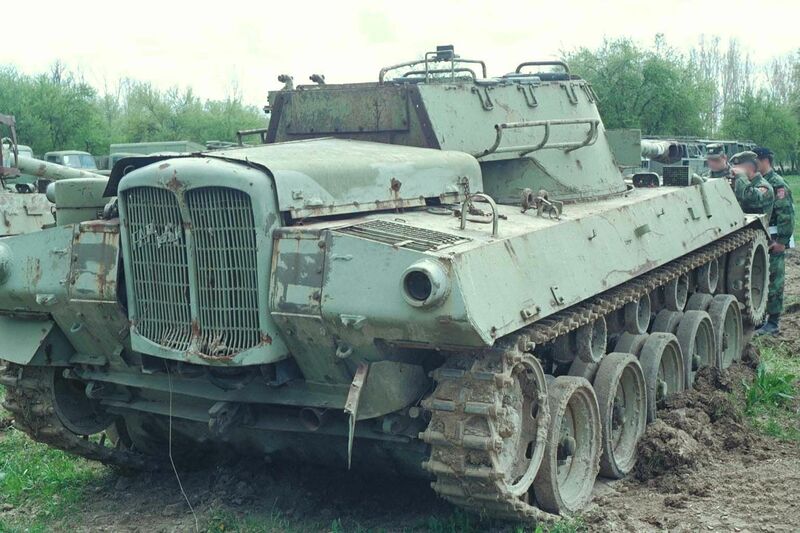 As for the Hellcat, the caption I found was "M-18 Hellcat Bijeljina Republic of Srpska April 2000", pictured in some open air "museum". Presumably (hopefully) a training vehicle similar to that T-54 with a Hellcat turret from those regional conflicts. Syria was the main user of the Panzer IV post war. Some of the Eastern bloc countries had them for a time as well, though I suspect Romania was a user as they had repair depots for loads of German vehicles, and Bulgaria just used them as static defences. The blog WWII After WWII's articles on WWII vehicles in the Arab Israeli wars doesn't paint many of them in a good light, and they were quickly removed from inventory to again be used as pillboxes. The Osprey "Modelling the T55" book says that the T54 with the Hellcat turret (one of the projects) was due to the restriction on ammunition above a certain calibre, they could obtain the 90mm ammunition for the Hellcat but not the 100mm ammunition for the T55 gun. Hence the turret swap (and the replacement engine of your example I guess). In the past err ...weeks since my last post things haven't been too glacial, but well, you may think that by the amount of stuff I'll be posting here today. I did manage to paint up another ruin, which is now sitting happily in a box in a cupboard after playing a tank battle a few weeks ago. See, I can even post a poor quality image of that game here. Its the ruin in the top right ...I think. Ahem, I'm now wondering if that's the first time I've posted an image of a game in this thread. Is it? Damn, well points for the low effort I guess. Ah, the incongruity of that board was in part due to not having all the terrain. ...As one of the other players thought we were playing on a Summer board instead of a Winter one, which explains why there's a big green puddle in the middle of the table. On which note, this week we'll be playing another game with my figures. This time on a smaller board (though likely with the same amount of terrain. Note to self: add more Winter terrain to your ever expanding list of projects which'll never get done). Oh, and with zombies. That brings me onto the point of the lack of progress elsewhere, as I've been in the process of painting around fifty of the things. I'm still short another twelve for a game this Tuesday, and the rest are in one of those aforementioned boxes, but I suppose expect a post on that subject in future. ...Sorry to be a bit of a tease. I needed some more Zombies to fill out the horde a bit more. Looking for options which fit the style of the existing figures (Studio Miniatures and West Wind) Clockwork Goblin's range from Konflikt 47 had suitably gangly proportions. When ordering those I had to add some other bits in to justify the postage of course. So I decided to throw some money at another set from that Weird War range. I'd looked at the SS Shocktroopers, but their exoskeletons and stockless rifles were a sticking point for me (or rather more importantly, that they're posed in a way which would make adding stocks difficult. You can have super human strength, but having something to brace a gun against would still help...). Instead the other elite infantry set "Daughters of the Motherland" seemed to have more going for it. Well, I mean after I modified them a little. Namely getting rid of the original heads and giving them some more reliable steel pot helmets for one (from Statureque Miniatures. 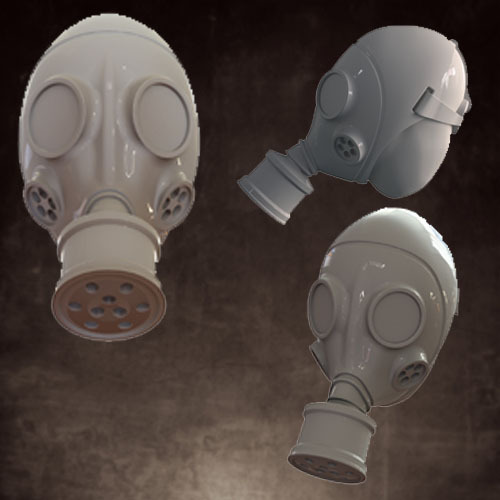 The gas masks are from West Wind - have fun finding those on their store...). I also went about adding stocks to their AKs where I could. Either just sticking on spare stocks where the poses weren't too bad, replacing the guns entirely (using a set from Crooked Dice - which is why some have larger barrels), or in one or two cases just giving them new weapons. Other than that the big Hammer and Sickle emblazoned on their chests met Mr Craft Knife pretty quickly, barring one on the leader figure (who'll be happy to know she's can be both proud of the Motherland and a massive target for the enemy concurrently). Oh, and they all had their backpacks removed too. Which I was relieved to find were separate pieces unlike on those Paratroopers which I'd posted earlier in this thread (they also oddly don't seem to have straps on them, so look kind of out of place sitting on top of those trench coats as they would normally). The new heads for one and removal of those Hammer and Sickles give them a look which brings them a bit more down to Earth into the setting I'm going for. They're still kind of a step away from being Imperial Guard figures, but hopefully will fit right in with those SS Stormtroopers in body armour which I'd made way back (who're already made from sci-fi models anyway). I'm chuffed how they turned out, and if it weren't for the price may have gone for more. Maybe they'll appear cheaper at shows in future. Otherwise potentially I may be looking at Statuesque Miniatures range of figures, who have a similar aesthetic to them (sans armour) - and if not, at least perhaps finding that old Commissar model I'd bought from them for my Fallout miniatures collection and giving her a repaint. As for the rest of my Soviet infantry, that's stalled somewhat. I'd bought a load of Warlord Games Terminator Geni... sys (¬¬) plastic figures intending to replacing their guns with AKs (more from Crooked Dice) and do them up wearing WWII era Soviet Steel Bibs. Ah, unfortunately that's run into one major issue for now. See the gas masks which are on two of those above figures aren't the only ones I bought from West Wind. Nah, I have like forty. Problem is, they're "true" 28mm. As in more like something you'd see on a 25mm figure. And the Warlord figures, well, they're a bit too big for them. This isn't too noticeable on the Daughters of the Motherland figures, but runs into "shrunken head guy" syndrome when stuck on one of those Terminator models. I know there's a load of 3D printed options out there, and companies do make appropriate heads with gas masks. Its just problematic that many of them are aimed at 40K, so finding ones which are suitably scaled is an issue. Germany and the modern period are also seemingly much more popular than the Soviets back in WWII, which was why I was into the West Wind heads so much (and disappointed to find out that they weren't the same size as ...damn near every other head that company makes). I want something which doesn't look quite as dated for the period as their other Soviet gas masks do (basic details, with an obtuse snorkel the front). A GP-5 or something. Or seeing as they're going to be based around sci-fi models, I may as well do what I did with my Germans and go with period heads to reel back the silliness. As far as WIPs go a few things have been worked on. But we don't talk about those, because in the state they're in they look like a 12 year old's Leman Russ kit bash to me. Here's a pair of things for talking points at least. I don't see it being mentioned here, but it takes me so long to post stuff that I could have just forgotten talking about it. So bare with me if I'm repeating myself. When rifling through the old half built things I'd come across another of those "Eber" Sd.Kfz 251 mounted on Panzer III chassis. Here's my second shot at the concept. This time around I went for a beefier armament instead of just a machine gun and did away with the roof passenger hatch. ...Because screw infantry even thinking about jumping down from there and not breaking a leg in a firefight. They'll make do with a rear door (and presumably a ladder). Originally it was going to have a T-34/76 turret and be in Soviet service, but that improvised turret on this already silly chassis was overkill on the "weird" war angel. In retrospect the Panzer III chassis aught to be reversed (the exhaust remain at the rear) and something done about the Sd.Kfz 251's engine compartment. Though it remains based on that one video game vehicle, so liberties are taken when it comes to the practicality of some design decisions. 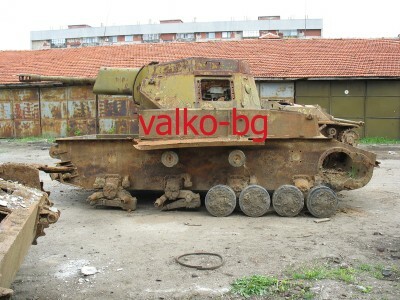 I really aught to look into how the engines are placed in those Soviet tank/ truck hybrids and work out if they're moved at all in the conversion process, but meh, I have that stupid Panzer II with a 75mm gun on it, so shouldn't be making a point about how well conceived these monstrosities are. Its a truck bolted onto a tank chassis for Heaven's sake. With that rambling over (till the next time I post that thing), here's the state of another of my WIPs. The T-34 based Artillery Tractor thing's had a bit of a redesign. Its cab and engine area are a bit more refined now, having gone through a few iterations (it was looking practically German at one point). Now its inspired a bit more by Soviet designs, just from a later period, as relying on the BTR-50 for this resulting in it looking like it had a massive forehead. Obviously I'm still working out things, which is why its a bit of a mess in the image (re: 12 year old's conversion projects). With those changes the rear bed was also widened. It was just looking too piddly compared to the cab using the existing dimensions of the donor truck. Now its perhaps a bit more realistic (the sides can fold down to be flush with the vehicle) and there's no longer wasted space on the track guards. As for the armament. Well for the moment I'm not sure about that. I did but a ZPU-4 from Spectre Miniatures to use with this vehicle, but I wound up finding out that the gunner figure comes attached to some of the major pieces on the weapon, and I just don't see the value in the amount of work tearing the figure off and rebuilding those areas would take (especially when I can just use the gun for my modern Middle Eastern project). Rubicon sells a quad Maxim Gun on an AA mount via their web store which may be an option. I've tried stick a Zis-2 and a Zis-3 on the back as well, but they won't fit without removing their carriages, and if I went that way I'd like to have some sort of cradle (I suppose I could build something appropriate myself). Other than just using this in its intended artillery tractor role, which its maybe a bit heavy for - and likely also wouldn't see much use as in the types of games we play (though I'm kidding myself if it'll be touched with an AA mount either) -, I'm not sure of what other options there are. It could do as an APC I suppose. That's all which is in a state I'm willing to show off for the moment. Ah, hopefully all the guff between the pictures padded out the post a bit. There's other dumb vehicle ideas which have been started since I last checked in. Though some of those might need to be taken around the back of the barn and get shot for being a bit too asinine (that Vichy French tank destroyer which I think I mentioned began as the Hungarian Panther that was posted yonks ago). 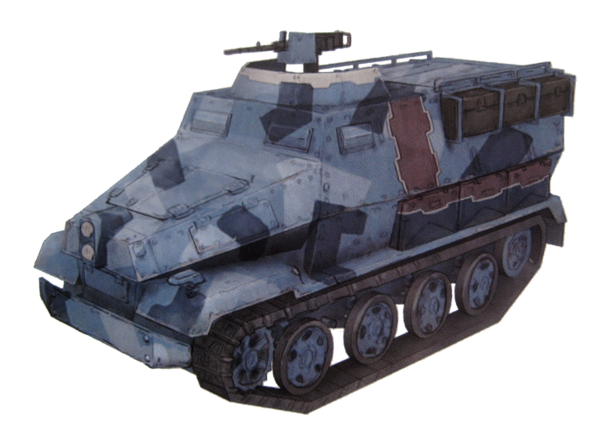 A Sd.kfz 250 mixed with a Puma's front end and lengthened tracks from a Sd.kfz 251 to give it full tracks instead of wheels was last night's project. ...But that's looking more like something you'd see in a game like Dishonoured than a WWII setting. Its a step away from having an Imperial Aquila bolted to the front. Maybe more on that later, otherwise its being called Old Yeller and you'll never hear about it again (I did mention it'd already began as a fully wheeled Sd.kfz 250 and a Puma based walker before I tore those up for this right?). You have certainly been busy. Are the Empress Modern Russian heads with helmets and gas masks too modern? Looking forward to seeing some close up shots of the ww2 zombie '46 game, to make me wish I was there..
Aye, those Russian heads would at least be having their helmets replaced. Ah, and well considering that the Soviets were using the GP-5 in this era, they'd be definitely a step up from those (less lung cancer). Secret Weapon Miniatures do a head which has prospects. They're made for Games Workshop figures, and is perhaps a bit too German styled however. Its a problem of finding ones which are both in scale, and fit the look I'm going for. Oi, you can slink back to your garage Paul. Tsk, here's me going out my way not to mention your name three times in case you showed up. I don't know who would win a game of post apocalypse/'46 town planning between you and Jard! You're both evenly matched I suspect in that department. Anyway, carry on with this great thread (the best I've seen, but I do lean that way, as you know) and I will watch from afar with interest, but remember watch out if you say my name 3 times... I've returned to Glasgow before unexpectedly ! Perhaps if I can start a project in every one of this forum's sub boards that will rouse you from the Garage to come back up here and ...I donno, dress yourself in a Kaiju costume and stomp about destroying all of my dollies. Can't say that I've checked what the building's owner's policy is for club members acting like prats that much. If I had more lamp posts then it wouldn't be post-apocalyptic town planning. Nah, then we could manage untouched urban areas to finally give up the pretence of this wargaming silliness and sit down to a proper city building simulator. Hmn, someone must have rules for connecting up the facilities and making sure we have the right zoning. On an unrelated topic. *looks up from painting table* Hmph, none of you believe me when I talk about the "piles". Bodies in the basement sure, but... Ah, here's some of those buildings I was talking about in that modern thread of mine. Right. There's your look. I'd rate it that there's an optimal chance that some of that stuff will be painted at a point in the next decade or so, assuming that I'm not killed by one of the larger piles of crap (which the site inspector I had out seemed to be concerned about. Once they were snuggly buried under a few layers of toy soldiers though you can hardly hear their moaning anyway). maybe one day I can visit your basement and you can visit my garage, are we talking order vs chaos here? the cosmic balance at work maybe..the universe moves in strange ways sometimes. I guess that's the strength of going to a club, you can blithely play and never know just how 'involved' your wargame friends are in the hobby, until you visit their home and get an insight, and maybe a shock sometimes. Carry on with the fantastic terrain building, yours are some of the best I've seen, photo evidence below from a recent game with your terrain (and a pic inside one of your buildings!). I rest my case.